Legacy of Hope Foundation works with the individuals and other organizations to provide gifts of clothes, shoes, diapers, blankets or food to needy children, mothers and families who have no where else to turn. We are able to sustain this outreach program because of the large number of donations that we received from churches and individuals in the US. For as little as $50 per month, you can sponsor one of our families below. The mother of these 7 children died earlier in 2015 from cancer. 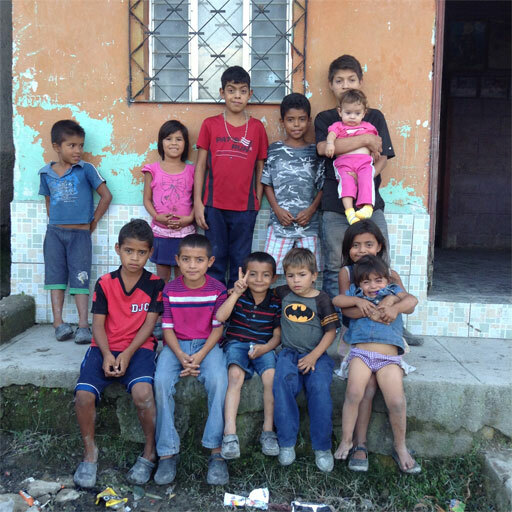 Their father has had to travel the 3 hours to San Pedro Sula every week to find work. He doesn’t want this to cause his family to disintegrate and has sought our assistance. For as little as $50 per month, we can help them with food. We will also be helping them with school supplies and uniforms in February, so that the children can continue to attend school. The mother of these 12 children died will giving birth to her youngest daughter. Their father is bed-ridden with Parkinson’s Diesease. The oldest 2 children have dropped out of school to care for their younger siblings. For as little as $50 per month, we can help them with food. We will also be helping them with school supplies and uniforms in February, so that the children can continue to attend school. This program is a partnership between Legacy of Hope Foundation and Pastor Jeronimo of Minesterios Vision Cristiana. It is growing rapidly and constantly adjusting to better meet the needs of the community and the church members. The church offers bible studies, youth meetings and activities, child discipleship, music instruction and opportunities to participate in farming project for the support of the church families. The children’s feeding program serves nutritious meals to over 100 children twice per week and also helps provide annual school supplies and uniforms to the children who attend regularly. The children’s parents are given the opportunity to learn skills to begin micro-enterprises, working toward the ability to support their families.